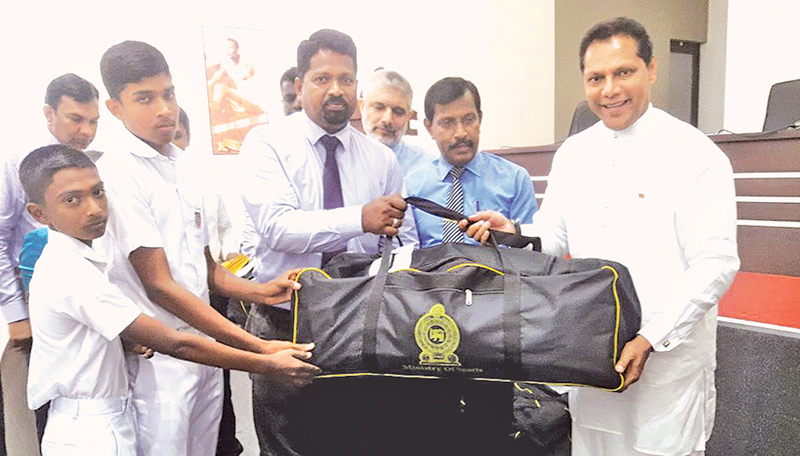 The Sports Ministry distributed cricket equipment to schools with the aim to develop school cricket during a ceremony held at the Sports Ministry yesterday. School principals, coaches, teachers and school cricketers were present at the occasion. Speaking at the ceremony, Sports Minister Dayasiri Jayasekara said that his ambition is to develop the school cricket infrastructure facilities and provide it with the necessary cricket gear to solve the problems that hinder the development of school cricket. “New schools are taking up to cricket. We know how much parents have to spend to by bats, balls and other cricket gear. We launched an important program with the support of Sri Lanka Cricket to train all the school cricket coaches in the island and completed the project successfully with the support of the Sports Science Unit. We hope to continue coaches training in 680 schools and have already allocated funds for the project,” the Minister said. Why does the Sports Ministry make a big song and dance about providing sports gear to schools?. It is expected that the sports ministry would provide , guide and facilitate sports in schools all over the country. Why are the ministers involved and spending lot of money? . The politicians think that they can get publicity doing their job. The sports gear should be supplied through the departments without incurring further expenses.